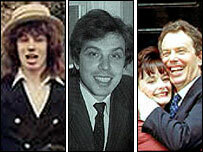 The life and times of Tony Blair - from rebellious schoolboy to global statesman. From election landslides to Iraq invasion: how key events mapped to Blair's poll ratings. How will history judge him? Three experts give their views on how history will regard Tony Blair. The BBC's Andrew Marr on the most media-obsessed government of modern times. BBC home editor Mark Easton assesses the impact on the UK's public services. It was 'education, education, education' in 1997, but what was achieved? How a dogged commitment to the peace process eventually bore fruit. BBC diplomatic correspondent James Robbins on the defining foreign policy legacy. BBC Economics Editor Evan Davis on the dire predictions for UK finances under Labour. Record budget increases, battling against deficits... but did Blair deliver on healthcare? The BBC's David Sillito looks at the cultural impact of the Blair years. Who's had the last laugh - the prime minister or the satirists? Was New Labour the greatest achievement of Tony Blair?